This document describes how to overwrite an existing file in the Course Content Collection. TIP: If you make corrections to a file, such as update a syllabus, it is best to overwrite the existing file. This saves room in your course and prevents unnecessary duplication. 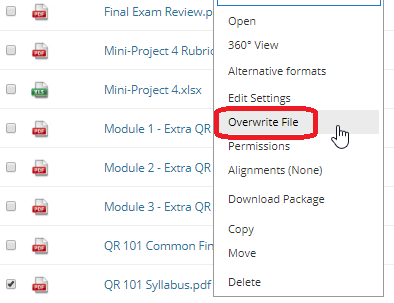 If you just upload a new file, the new file does not overwrite the existing file, but creates a copy with a (1) after the file name (syllabus.docx, syllabus(1).docx). Browse your computer to find and attach the updated file. The file previously used in your course has now been replaced by the newly overwritten file.